I ran the NYC Marathon on November 3rd. I could go into all kinds of details about how I trained, how I tapered and how else I prepared for that day. Seriously, I could. It appears I have an endless capacity to talk marathon. 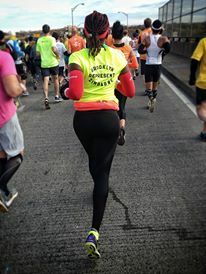 I could tell you about the many obstacles I had to overcome to get to run the marathon and how, instead of taking those obstacles as divine signs that I was not meant to run the marathon, my determination was only strengthened. There are stories to tell about how, in addition to this being my first New York Marathon, it was also the first time I rode the Staten Island Ferry, even though I have lived in New York City since 2000. It was the first time I set food on Staten Island, though I have driven through it, on my way to New Jersey, countless times. It was also the first time I have run a race that are started by a cannon blast, followed by Frank Sinatra singing “New York, New York”. I struck up conversations with a man who has run the NYC marathon 27 times and several other people for whom, like me, this was their first time. While waiting for the race to begin or while being herded out of Central Park when the race was over, each time standing among more people than I imagined, I chatted with a man from Ireland whom, after running a marathon at 25 and giving it up, had come back, 30 years later, to run a faster marathon at 55 than he had at 25. I struck up a conversation with a man from Guatemala who seemed to be running the world – Tokyo was next, after Buenos Aires, Berlin and New York, to name a few. I happened upon two of my running classmates and we hung out at the start line and set out together, very excitedly. I could write a book about Sunday that I would find absolutely gripping and that most people would yawn and think – why would you do that? That’s a question that I am asked often. I was asked this when I showed up at work with skin missing from my collarbone because an errant zipper rubbed it off during a three hour run. It’s a question that I was asked after people found out that I was running a marathon and I would win only if my husband tripped up the thousands of people ahead of me. Yes. Thousands. And yet, even as I was asked, I continued to train hard and then run a marathon. When I walked down to the end of my block, in 2001, and watched the marathoners running by, I was blown away. As a regular runner of three miles at a time, standing between miles six and seven, I wondered what kind of fitness and genetic gift it took for a human being to run 26.2 miles. I was already impressed that they had completed six miles already. Over time, though, I found that running long distance begins with the belief that it is possible, and the will to work toward achieving that goal. Others may not understand what what I am doing or why I am doing it – I may not fully understand it myself – but there I am, doing it. Humans will do unbelievable things be they incredibly inspiring things like running for 26.2 miles, sometimes at a 5 minute mile pace, sometimes at a 10 minute mile, and sometimes on prosthetic limbs. Human beings will also do unbelievably heinous things like running massive Ponzi schemes, embezzling from a nonprofit or just selling inside information. People will surprise you with their audacity, their determination and their will to succeed. Good or bad, people are really good at being unbelievable. I know I am commenting rather late for your November post. I wanted you to know, that if you wrote a book about your experience running the New York Marathon, I would read it! I too am amazed by what we can do when we set our mind to it. Whether it is something amazingly good or unbelievably bad. A marathon can bring people from all over the world together with a common goal – to finish. I am always inspired by the number of runners and how different they are! Young and “senior”, different nationalities, different disabilities (we had a blind runner compete in the half marathon at last year’s Illinois Marathon), and different abilities. Those who run 26.2 miles are an inspiration to me, a 13.1 mile runner. Someday I will join the 26.2 mile group. Until then, keep running! and keep blogging! Thanks for coming by, Bethany. I hope you find more posts that are interesting! Funny, I still think that running 13.1 miles is pretty darn impressive. After I ran my first half, I felt invincible! The feeling has not diminished. It’s a big deal and the added bonus is that you have just enough energy left to actually celebrate! I am glad that we both take part in an activity that is inspiring and amazingly good. Hopefully we can deter and discover those who indulge in activities are are unbelievably bad. If Bethany is late, I am retrieving from the archives. Great article. I thought this article was written after the November 2017 NYC Marathon. I was extremely impressed because this past Tuesday you displayed no traces of someone who completed a marathon two days prior. The 2013 NYC Marathon was my first marathon as well. My eyes swelled reading our shared experience. The I met people with different stories, but everyone of them were note worthy as well. You should definitely write the book. Also, that race marked a turning point in my career. I NEVER dreamed of running more than three miles until 2011 when a friend introduced me to concept of participating in races. Training with run clubs sparked the idea of running a marathon. After I spent countless hours training, my speed and endurance proved. I believe running begets clarity of the mind. I started to make the connection that I could ‘train’ to become a CPA.. After completing my first marathon in 2013, I dedicated the next three years to the completion the CPA examinations. You are absolutely right “humans will do unbelievable things” when they have “the will and the drive”. I pray more people use their drive for good and should they chose not to, you [Rumbi] will detect their fraud. A’Isha that is such a joy to hear! I am so glad to hear your story and it is wonderful to meet you and be on our Toastmasters journey together!